Dressed up as the Link Link circus ringmaster, Isabella Rossellini steps out onto the Grand Opera House stage which has been adorned with children’s toys. Sometimes standing behind a lectern underneath a big screen, sometimes out front closer to the audience, the actress explains how she went back to college to study animal behaviour. Ostensibly a 70 minute science lecture, Rossellini answers the question of whether animals can think or feel. It’s full of neuroscience mumbo jumbo, synapses and cognition, but it strings together different experiments and factoids in a chain that becomes as convoluted and hard to follow as one of the complex vaginas projected onto the screen. 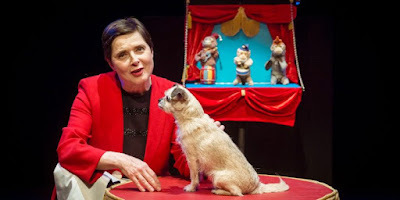 Rossellini illustrates her talk with short-films, uses her cute costumed dog (the bee outfit is the best) as an audience heart-melting device, and is assisted by a mostly wordless Schuyler Beeman who carries on ladders and coat stands that have been repurposed as giant props. Brought to these shores by the Belfast International Arts Festival, the performance would have been equally at home as part of the NI Science Festival programme. She teaches her class about animals planning for the future, retaining reproductive control in the face of sexual predators, showcases a whaley large brain and discusses whether deception and culture show off advanced cognitive function. Link Link is quirky, funny, sometimes quite surreal, and probably what watching an early Saturday morning BBC Two Open University lecture thirty years ago would have been like for someone nursing a hangover.